It's really hard to lose a government contract. This card sums up Weyland. Score points; make money. Its only drawback is being a 5-advancement requirement. But once scored, it provides near-limitless economy for the rest of the duel, on par with Magnum Opus, even if a bit inflexible. It doesn't provide the burst econ that Hostile Takeover or Geothermal Fracking does, but it also doesn't stick you with a Bad Publicity, either! It decreases agenda density, which is great in kill decks (Punitive Counterstrike appreciates these agendas). If you're scaring the Runner with Project Junebug, you could probably install - advance - advance these agendas and put on a bold face, daring the Runner to act. 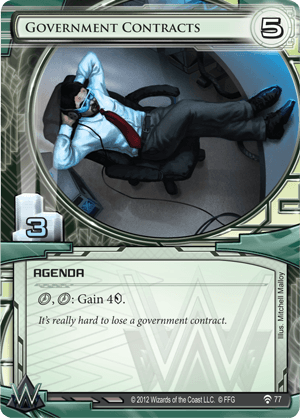 I'd consider this agenda for any Weyland deck seeking 3-pointers.